The Advantages of Dental Implants by Plano, TX dentists Dr. Stephen Bass and Dr. Ellen Hall. 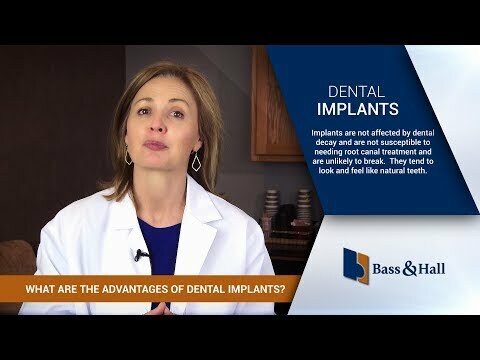 What are the Advantages to Dental Implants? One of the greatest advantages of dental implants is they can be used to replace failing or missing teeth without compromising healthy, remaining teeth in the mouth. Other advantages include the fact that implants are made of titanium metal and, therefore, are not susceptible to dental decay. They're also not susceptible to needing endodontic therapy. So they have the potential to last a lifetime. By placing the implant in bone, we help preserve that bone. We help preserve the bone around the natural teeth and where the tooth was missing. In the past, a dentist would cut down the adjacent teeth to fill the space with a bridge. Now with dental implants, your dentist doesn't have to cut down the adjacent teeth. In patients who are missing many teeth, this can reduce the dimension between your nose and your chin, causing premature signs of aging. Having dental implants can help preserve this bone and tissue, keeping this dimension between your nose and your chin normal and avoid those premature signs of aging.